COLOGNE– In a sure move, that seals the demise of Vice President, Joice Mujuru, and killing her bid to succeed President Robert Mugabe, the country’s hardline military chiefs have reportedly declared that, Zimbabwe can only be led by a Zanu PF politician who not just participated in the liberation war against British Colonial rule, but also attended the historic Lancaster House Conference in 1979, which paved way for Independence, The Telescope News, can exclusively confirm. Neither Vice President, Joice Mujuru, nor her late husband and Zimbabwe’s first army commander at Independence in 1980, the late General Solomon Mujuru, attended the London talks, leaving an open political cheque for justice minister, Emmerson Mnangagwa, to sail through as the new definite President in waiting, because the new army succession criteria favours him, after he took part in the Conference in his capacity as Mugabe’s personal assistant at the time. According to Mugabe himself, General Mujuru did not take part in the talks but remained “in the front fuelling the war of liberation”. The vice president was too junior to have been among the the Zanu PF strongman’s delegation, which included among others, the following politicians, most of who are now deceased: Josiah Chinamano; General Josiah Tongogara; Dr Herbert Ushewokunze; Edson Zvobgo; Walter Kamba; Josiah Tungamirai and Simbi Mubako. The Telescope News, has since projected that Mnangagwa will succeed Mugabe, and is likely going to receive support and the full backing of the military and secret service, two institutions, which he has managed to build his power base around for years, as opposed to Mujuru, who is counting on the respect of Zanu PF’s constitution to take over from Mugabe, as she is clearly the next in line to power, if things are to be done by the book. “The top cammanders of the military, have made it clear that, Zimbabwe’s next leader is one who not just participated during the bush war against Ian Smith’s regime, but must have also attended the Lancaster House Conference,” said a Zimbabwe National Army (ZNA) public relations officer in Harare who requested anonymity during a weekend telephonic briefing with us. This publication also broke the story about Oppah Muchinguri readying to seize control of Mujuru’s current post, with the help of Mnangagwa’s backers in June, and it appears our report was spot on, amid a fresh wave of political skirmishes between the former Zanu PF Women’s League boss and the VP. In veiled attacks aimed at each other, at the just ended Women’s Conference, Mujuru told delegates that someone among them would soon betray her, in what many believe to be a salvo directed at Muchinguri for allegedly plotting to challenge and unseat her at the party’s elective congress in December. Muchinguri did not go quiet either, and took to the podium to tear women “who burn their husbands” at home, a broadside which needs no further interrogation. So messy is the Zanu PF war on Mugabe’s throne, such that Mujuru’s top ally and closest confidant, presidential affairs minister, Didymus Mutasa, received a dress-down by Ambassador Christopher Mutsvangwa, over the weekend for being a coward who only joined the liberation war effort during the eleventh hour, following years of exile in Britain. 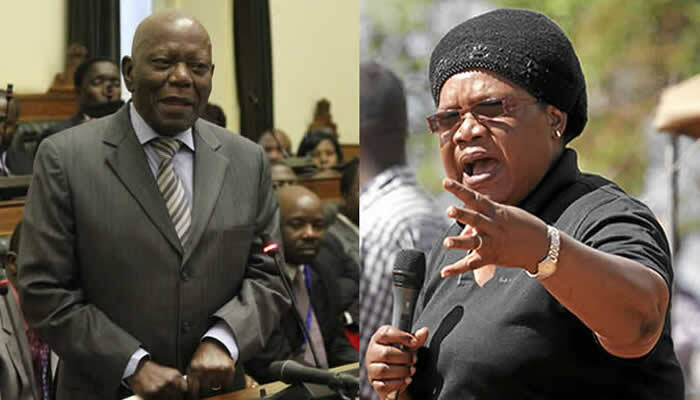 Mutsvangwa called for Mutasa to be reined in, for causing divisions in Zanu PF and for fooling Mujuru into believing that she will soon succeed Mugabe. Mutsvangwa made the attacks in his capacity as a war veteran, using the State media last week. The deputy minister of foreign affairs, has shocked Zanu PF, by coming out with his guns blazing against Mutasa and Mujuru, who he maintains never gunned down a Rhodesian helicopter, dismissing the heroic act as a lie peddled by party commissar Webster Shamu. We also have it on good authority, that the country’s top generals fronted by Zimbabwe Defence Forces (ZDF) Commander, Constantine Chiwenga, are the so-called Zanu PF elders, poised to handle Mugabe’s succession issue at the appropriate time. In a rare interview with Supa Mandiwanzira’s ZiFM Radio station last month, Mnangagwa said the party “elders” will decide the way forward insofar as the succession issue is concerned. The cunning politician also said there was protocol to be followed in Zanu PF, which is based on seniority for one to assume top leadership. Moving the chairs around on the ‘top deck’ whilst the Titanic sinks! That’s brilliant brother!!!! If all these idiots who want to be the wisemen, calling themselves “elders”, “JOC” etc, had time sit down and reflect on what’s happening around the general populace and not what’s happening amongst themselves as “generals” they would be wisemen indeed!!! If there’s any substance in this story about Lancaster House Conference then it shows that we’ve imbeciles who’ll never move any inch. How does this become a qualification? How does this affect those in opposition politics? Who are these gonorrhoea infested monkeys to talk about Lancaster Hse Conference when at the time they were mere war collaborators with tails between their legs? Are these bandits worried about their future, I mean are they haunted by their genocidal activies that they’re in overdrive selves preservation mode? Who’re they to come up with such hogwash??? It’s all over for you charlatans!!!! War be unto you murderers!!! It’s not the Lancaster House Conference they talking about, it’s “The Gukurahundi Genocide” these naked mad men are talking about which puts Mnangagwa as the last man standing and The Chief Architect of Gukurahundi!!! Get it right Zimbabweans, that the naked truth!!!! If this story is true and has any resonance, it just goes to show that we have a vision-less section amongst the liberators. There are liberators who genuinely have the country at heart and Vision. With or without vision, all you need is to have your country at heart. Assuming this report is factual, who qualifies for running the country in the absence of a Lancaster house attendee? In 25 years down the line most liberators will not be around, nor will there be a Lancaster house attendee. These men will not come out in the open and express such ARBITRARY reservations because they are in full breach of our constitution. The constitution is very clear about who qualifies for running for Presidency. Running for Presidency is not the preserve a few men, whose mandate is to defend and protect the constitution itself. And speaking of the CONSTITUTION, why is reference being made to the Lancaster house constitution? I thought we had a new constitution, thanks the the GNU, which now supersedes the Lancaster House talks. It shows that we have some men who are living in analogue age, when we are in a digital age. I doubt that this will ever be an official position, because the Generals themselves know that it will be in breach of the new constitution and profound scrutiny could tantamount to treason. The heading of this article is verbose and vague. Why not just save us the reading time. “Lancaster House attendee” could have been summarized to Munanganwa. For instance, the writer could have headed the article as follows: Military bosses want Munangagwa as Mugabe’s successor. This proves that Zimbabwe is a Milatry state in all but name. I find it extremely frightening that the top army officials have so much power and so much say. And then someone wants to tell the world there is democracy in Zimbabwe. Shame on these army boss fools. Zimbabwe belongs to the people of Zimbabwe not you damn fools. It is the people of Zimbabwe who decide who their leader should be NOT you corrupt & mentally challenged fools who only got to your stupid posts because of your loyalty to that old fool of Malawian origin. Mnangagwa shld know that if he manipulates the security forces to pave a way for his ascendence to the highest office, then just like his predecessor Mugabe, he will also be nothing but a common thief, oppressor & political dimwit. God help us. This story will have no part two. When Mugabe goes a new chapter will begin.Those that are positioning themselves to carry on carrying on with Status Quo are in for a rude awakening. The cake is just too small for so many vultures. When the people start to ask for their share all hell will break loose. The prisons will be full. There is nothing except for God that has no end. So the Judges will truly be able to say “THIS IS THE CASE OF THE PEOPLE AGAINST ….” and so they shall answer to the people. As is always the case when a ship starts sinking you will see the Rats and the cockroaches leave the ship first. Already they fight. Then there are those that have been controlling the ship. The ship starts to sink. They start to argue and fight because they don’t know what to do. Some will try to jump off. Sharks will be waiting. Laugh now if you want but ipiki iyeza. In many ways 2008 represented a stealth-coup, with the military refusing a release of the true election results. They got away with it then against Tsvangirai and are looking to do a repeat performance against VP Mujuru. This is no idle threat. With General Mujuru removed they will be feeling confident. But for this to have any chance of success, Mugabe must still be alive, i.e. Congress 2014. Even then, they risk the split we outside that party have always hoped for. Plus the general had many admirers in the armed forces who have not forgotten. This is no gullible and passive MDC they are facing. Rwendo my brother, they will be soon facing the Masses. You’ve been reading here a while now. A lot that has been said here by others ON THIS FORUM has come to pass.Remember the one called Hutu. All he told us was going to be exposed was exposed. There are people that hold records and evidence that are waiting for when the time is right. Some are or were in the Armed forces, some are or were in the police force. Some are or were in Government. If the MDC want to remain passive they will be left behind BY THE MASSES. Doctor, I will be over the moon if you and others are proved right and the people finally rise up. However, forgive me if I will not be holding my breath. I more anticipate the people will stand back, spectators, as the factions wrestle on, waiting to see who is the eventual winner. Rwendo I don’t blame you for not holding your breath but history will tell you that even the most peaceful can only be pushed to a certain extent.The Zimbabwean masses have been pushed into a corner. Soon there will be no room to move. When the breaking point comes it will be sudden. Look at the Arab countries that were like Zimbabwe ruled with a fist of Iron. Suddenly those regimes like sand castles were washed away. They were so set in their ways they never saw it coming. After the Arab Spring, the Egyptian generals are back in power, Libya is in a state of anarchy, and Assad has far from given up in Syria. It isn’t easy to have a revolution when the regime has all the guns. Mr mugabe could you pliz stepdown and allow new ideas in our country future,you have done your part ,thank you. Pamberi mob justice sekurus !!!!!!!!!!!!! Lancaster house was nothing more than semantics so the british politicians could say “look at us, how caring we are…”. The result was a done deal before it started and no-one gave a proverbial as to who ruled the country or how! The lancaster house constitution is now history.We have a new constitution now.By virtue of attending a meeting you cannot obtain a degree or good qualities of leadership.The lancaster house constitution was a ceasefire document that was not thorough resulting in it being replaced by the new constitution.All those who crafted it made big mistakes. Service chiefs can not qualify any one for presidency because that is done by the constitution.The constitution gives guidance on how the country should be run not soldiers or war vetterans.It now time to look at our country with oneness not greedness.If munanangwa will succeed president let it come from the normal channel not millitary coup.What generals are saying will jeopadise the good qualities of ED Munangagwa. Please let him compain for himself .